There are three types of file links supported in the NTFS file system: hard links, junctions, and symbolic links. Use symbolic links if your system version is higher than Windows Vista. Others You can delete hard links in any order regardless of the order in which they are created. A junction (also called a soft link) differs from a hard link in that the storage objects it references are separate directories, and a junction can link directories located on different local volumes on the same computer. Otherwise, junctions operate identically to hard links. Symbolic links are transparent to users; the links appear as normal files or directories, and can be acted upon by the user or application in exactly the same manner.Symbolic links are designed to aid in migration and application compatibility with UNIX operating systems. 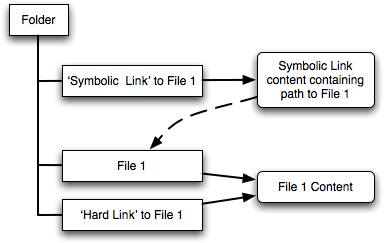 Microsoft has implemented its symbolic links to function just like UNIX links. Junction points are a type of NTFS reparse point.